The last thing an enterprise needs is to get locked into a costly, long-distance subsea connectivity service. Flexibility and agility is critical for success, as multinational businesses experience varying levels of network traffic. 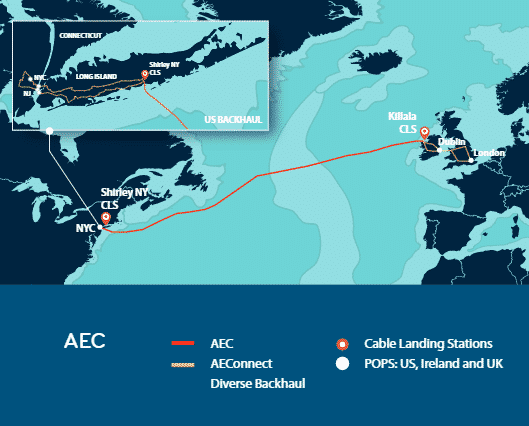 Megaport (USA) Inc, the subsidiary of Megaport Limited and a global leading provider of Elastic Interconnection Services, has partnered with Aqua Comms DAC, Ireland’s first dedicated subsea fiber optic network provider interconnecting New York, London and Dublin. The first phase of this new partnership will give Megaport’s enterprise customers access to Aqua Comms’ America-Europe Connect (AEConnect) system, enabling elastic interconnection to its transatlantic subsea network using Megaport’s global Software Defined Network (SDN). For Megaport customers, this means direct access to agile and flexible infrastructure, allowing them to rapidly provision services, including direct cloud connections and two-way, Point to Point transport between the U.S. and Europe for multi-cloud, multi-region and hybrid cloud architectures. Customers will also be able to consume elastic bandwidth on the Aqua Comms system, which will enable them to pay for what they use and adjust as business demands fluctuate. Megaport will be ready for service in early December 2016. Megaport CEO Denver Maddux spoke about how his company’s partnership with Aqua Comms is a game-changer. To learn more about Aqua Comms, click here. For more information about Megaport, click here.